Wireless speakers are becoming more popular lately. I guess it's because the convenience it has given to the user. Handy, small, rechargeable and with unique features and style who doesn't need one? I'm grateful that I have the opportunity to review one of them and it's the DKnight Magicbox Bluetooth speaker, color Black. This time the company didn't send me any promo code to purchase it myself. The product arrived in the mail via UPS. It was packed in a white bubble wrapped envelope. I was able to examine the packaging to inspect any damage but found none. And so I proceed on examining the wireless speaker. 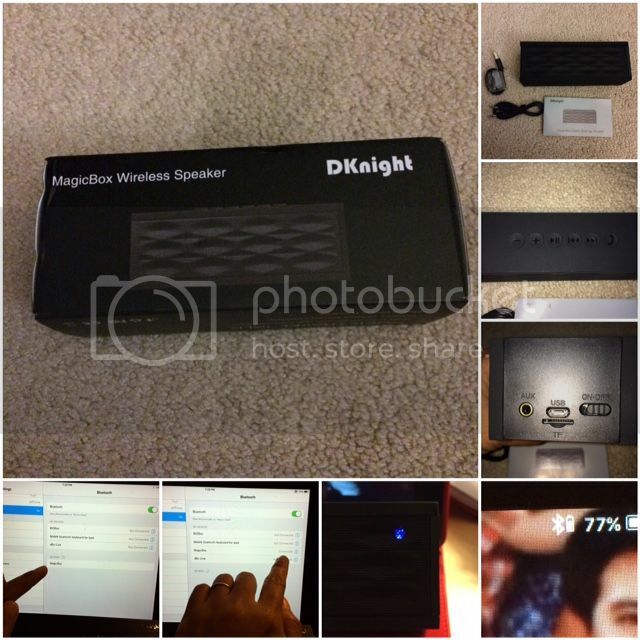 What's inside the box are: Dknight Wireless Bluetooth Speaker-Black, User manual, and both the cables. The speaker is very handy, lightweight because it only weighs 8.3 Oz and the size is just right. The dimension is 6 x 2 x 1.6 inches that would also last for up to 10 hours. The item I received was already charged and so I was able to use it while I watched my favorite TV Show on my iPad. It is very simple and quick to connect. I never encode any kind of code to my iPad in order to sync the wireless. The sound is amazing, very loud when I put it all the way to the highest volume. For the List Price: $99.99, you can buy it for the Price: $27.99 and Free shipping (3-5 days) for Prime members HERE. You Save: $72.00 (72%) worth the money you spend. I think this is awesome! My two girls would love this! I bet, your home is full of cool gadgets buy now with all these things you've been getting. Nice review. wireless speaker is a nice idea...but how long does its power lasts? Nice review. Not familiar with Bluetooth speakers but I find the gadget color cute.